Q.When you started your IMA in Dwarka? Ans. Dr.Amitabh Khanna, Dr.Kiran Bannerji and myself took an initiative to establish such an organization way back in 2005. We are the founder members, at the time of opening we have started with more 60 doctors. Q.Did you have previous experience to run such organisation? Q.What is the strength of your Association, Dwarka? Ans. Right now, we have 206 life members and 25 associates members(without voting rights). Q. Do you get any assistance from other organisations? Ans. Yeah, We get help from Delhi Medical Association and Indian Medical association. Q.Name few executive members of your association? Ans. Myself President, Dr.R.K.Bhatnagar-Secretary, Dr.I.K.Kasturia-Finance Secretary, Dr.Surender yadav-Vice President, Dr. Neeru Kiran- Vice President, Dr.Sharad Shrivastav-Joint Secretary, Dr. Piyush Ranjan-Asstt. 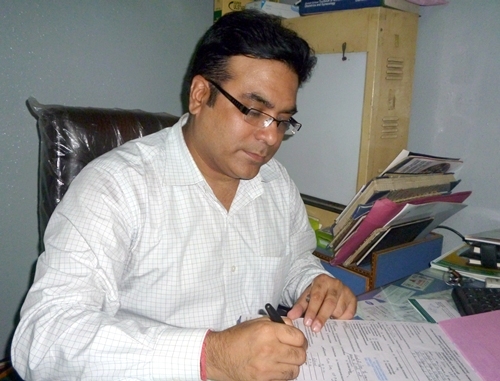 Secretary, Dr.Vikram Chopra-Asst. Finance Secretary, Dr.V.K.Mutreja-DMA State Executive, Dr. Kiran Shankar-DMA State Executive, Dr.Rajesh Madan-Executive, Dr. Vikas Gupta-Executive, Dr. Sanjay Verma- Executive, Dr. Mukesh Verma- Executive, Dr. Ashish Pitale- Executive, Dr.B.Ramachandran- Executive, Dr.Subhash Seth- Executive, Dr. Raj Kumar- Executive, Dr. Pankaj Taneja- Executive, Dr.Bharti Seth- Executive and Dr. Vikas Khatri- Executive. Q.What is the major problem of doctors in dwarka? Ans.Dwarka has been developed by DDA but the authority never think to provide even small plot for doctors to establish good clinic. If DDA can provide huge plots to schools then why Doctors are ignored. There are only four govt. dispensaries and they are unable to meet out medical problems of entire Dwarkaites. Q.What kind of guidelines/ suggestion your organization give to the poor patients? Ans. We organized different free camps for general public and the needy from time to time, vaccination camp, participation in pulse polio campaigns are our regular features. Q. What are the major issues, your association fighting for? Ans. In Clinical Establishment bill some provision are not in favour of doctors. Q.What is the official address to communicate you? Q.Any other point you want to share with the public, please explain. Ans. Doctor-Patients is a holy relationship, it should be continued on good faith. This medical profession is noble profession so the dignity of it should be maintained from both sides with good heart.